The Punk Rock Flea Market is now in it's second year! We were happily surprised, upon walking in this year, to see that it was more crowded than last time….and bigger. Ben Sisto did a good advertising job this time. He had a full page in The Noise and an ad in both The Phoenix and , one of our favorite pubs, The Weekly Dig. Housed in the Mass College of Art gymnasium there was lots of space…and lots of tables. Rows and rows of bargains for the taking as a matter of fact! Lots of interesting and fun stuff this time around. Not only that! All the prices were very, very reasonable and if for some reason, maybe being cheap (like Miss Lyn) you didn't think so, the vendors were ready to talk. And as you can imagine, being at Mass Art there were a lot of artist/art-student made items…which was a great thing! 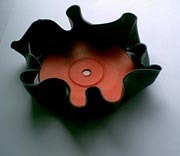 We got a laugh out of the "Record Holders"...not a holder for your records mind you, but a record that was melted into a bowl shape. The EP's "you can use as ashtrays and the ones with the big holes in the middle (45's!–ed) and the LPs you can use to hold stuff." the vendor explained. Ending up in the Cut-Out Bin is one thing, ending up in the oven…well now that's embarrassing. A couple of those just had to be purchased. 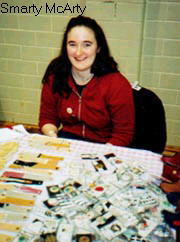 A girl named Smarty McArty had a table of handmade items, the stand out being her 1" pins. They were like mini mixed media collages! Awesome really! Some with single words, collaged over interesting patterns, postage cancellations from an envelope with the perfect touch of a remnant of handwriting…enough to just fit on the pin and make a really neat composition! Those were just a buck!! A few were picked up…one that said "Y'all" for Mr. I-was-Born-in-Virginie-Ken-Highland! Miss Lyn eyeballed a table with a set of handmade cards quoting Nick Cave songs from his No More Shall We Part CD. What a great idea!!! This girl had really nice note cards and postcards with assorted sayings and poems on them. There were a couple/three tables with handmade herbal soaps and candles, all smelling very nice! Some went even further with body balms, lotions and bath salts. There were also a few tables with tote bags…seemed like a big thing this year. 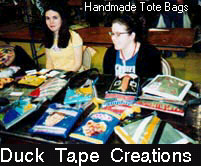 Tote bags made of felt and feathers, tote bags all made of Duct Tape, "Patch Your Pants" tote bags made of various materials with a special little patches with names on the front. Assorted funky fabrics and colors tote bags…lots of tote bags. Also a few pillow offerings..large and small of cool fabric designs or velvets and trims. There was also handmade paper and books and notecards of handmade paper which were really nice. And we wonder if there was a new kind of class at Mass Art this past semester in stuffed doll making coz we saw at least two tables selling weird dog or pig looking animal creations with or without eyes, with and without clothes…a couple strands of yarn hair stickin' out of the tops of their heads…funky but cute. Now, no Punk Rock Flea Market would be complete with out the used records,cds, videos, clothes and books, right?? Blowfish went to a table and scored four Jackie Chan videos for a buck each! Cha-ching!! Buy of the century!! At the same table the guy had buttons, pre-made and made up to order. Blowfish scarffed a few of those and got prices for BGN buttons. We'll have them at the BGN party in June if things go as planned. Miss Lyn bought a bag vegan jerky at the same table for just a buck…too salty…but Dillon Highland enjoyed it as treats for a week! There were lots of videos, you know…stuff Rob Zombie would love and foreign films and music videos and lots of bootleg videos too. Miss Lyn got a couple books, there were plenty to be bought! Blowfish scored The Dropkick Murphys Single Collection and The Unseen Complete Singles Collection CD's for $2.00 each. Mega bargain, yeah!! And there were lots of clothes: punk, vintage, just plain used. Some people had stuff hanging on racks, others had boxes and piles on the floor and on their tables. Miss Lyn got a $2.00 sleeveless t-shirt with some japanese writing on it and a $3.00 green soft & fuzzy wool scarf she hasn't taken off since! So guys it was an enjoyable experience and a day of bargains for sure! 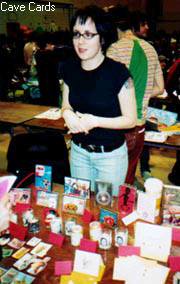 We look forward to the next Punk Rock Flea Market, which we hope will be around Christmas time! We'll keep ya posted..be sure to make it there next time, it's worth the trip! !